I daresay you haven't had much practice,' said the Queen. 'When I was your age, I always did it for half-an-hour a day. The quotation leapt into my mind one warm morning a few weeks ago when I managed to jet all 500 of my sheep against flystrike—including the rams—before breakfast. I was feeling quite understandably smug about my system for applying the organically certified compound Extinosad (derived from a naturally-occurring soil bacterium, Saccharopolyspora spinosa). 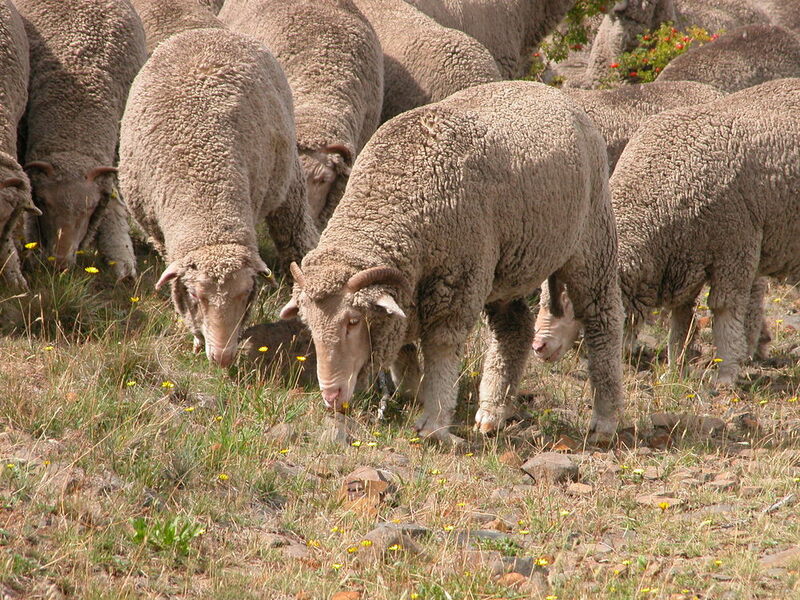 High-pressure nozzles in the jetting race are activated by the weight of the sheep going through. 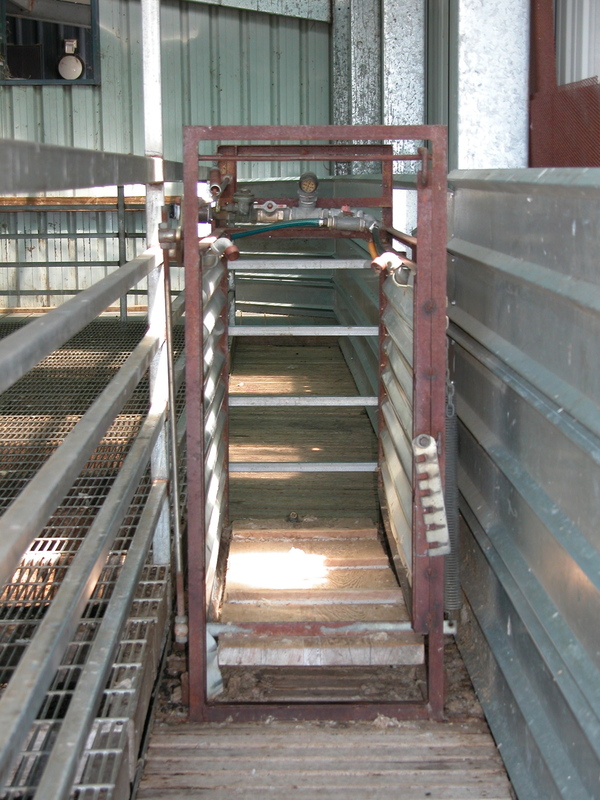 The clever part, though, is having this race permanently sited in the exit lane from the woolshed, so the sheep have learned they have to go through it to get out. Hence, one sheep runs through it every second or less, and I don’t even have to be close to the race to encourage them along. I spend my time moving sheep up to be ready to follow their friends and relations. Totally cool. The jetting race, looking back “upstream”. The sheep would be coming toward the camera, and the nozzles you can see apply the jetting solution. I always mean to take photos of the jetting race in action, but forget to do it in the excitement of getting sheep running through. Maybe next time. If I remember, I’ll add a photo to the next Yarn. However, once I realised my error about doing vs believing impossible things, I was left with a quandary about what to say in this Yarn. After thinking it over while shepherding and running the dogs, I decided to talk about a few things that aren’t truly impossible, but still strike me as so improbable as to require practice in believing. Invisible crickets. Trust between species. Anti-itch plants for sheep. Fertilsation by fire. The amazing resilience of nature. That’s probably enough. Let’s see how much will fit in my usual template of a couple of pages of text. In autumn, after a big rain event, the loudest crickets I have ever heard start up around the property. You can track them for many metres following their sound, only to find—nothing! I finally realised they had to be underground, although there is generally no sign of a burrow. They are called “mole” crickets (Grylloltapidae), are powerful tunnellers, and spend most of their life cycle underground. The males construct specially designed tunnels to resonate their mating song. Totally cool. A Tasmanian mole cricket. It’s about 3.5 cm (1.5 inches) long. Every single time I go shepherding and my sheep choose to follow me, I’m awed and humbled all over again. Maybe in a few more decades, I’ll come to take this trust for granted, but not yet. With the major upheavals over the last few months, flock dynamics have changed dramatically, and in ways I probably haven’t even yet noticed. The sheep that have gone took with them a spectrum of talent and wisdom I could not have identified as belonging to specific animals, with the exception of Old Leader. The best I could do in making choices about who would stay was to keep the known individuals and a cross-section of ages to try to preserve the wisdom of the older sheep along with a majority of younger sheep to rebuild the flock. While the flock follows me more readily now, I haven’t yet seen a definitive new leader emerge, and I would say the flock is not as confident in its movement through the landscape, when I’m not leading them, as they were 6 months ago. Horatio is often to be found at the front of the flock, at least when I’m leading. He’s a big, strong, smart wether. He could be the next flock leader. Or not. At 2 years old, he’s probably still a bit young to assume the mantle of leadership. A year or so ago, I watched in some bemusement as a line of sheep took turns to rub their faces in a big mullein plant (first photo above). I went home and looked up mullein (verbascum spp.). It has an illustrious reputation as an herbal cure for a wide range of afflictions, though there is not a lot of clinical evidence for acting as anything other than as an astringent and topical soothing compound. Head and face rubbing is more common in sheep than you might think, but no one knows for sure why they do it with specific plants. A few days ago, I watched again as perhaps a hundred sheep in the flock took turns face-rubbing mullein, this time principally the stalks, even pawing the basal leaves away from the stalk to get more of the stalk exposed for rubbing. It took them about 20 minutes to destroy (but not eat) the mullein plants. I have not seen them do this with any other plant on the property, so I’m going with the idea it soothes the more or less constant mild itch around the horn buds that all sheep have. Mullen and Sheep Ballet from Nan Bray on Vimeo. The lucerne (alfalfa) growing like Jack’s beanstalk in the burn area. With 3.5 inches of rain since the big fire in early January, most of the burn area is lush and green as a golf course. Or an irrigated, fertilised paddock. 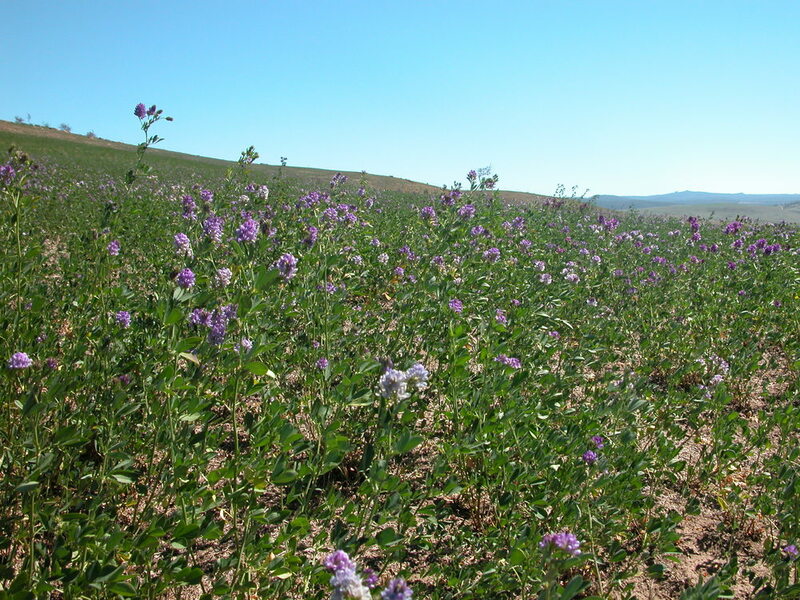 The lucerne (alfalfa) is 2 to 3 feet high, in full bloom and alive with the murmur of bees, where 8 weeks ago there was only a blackened crust. I haven’t ever applied chemical fertiliser to my property, and I’m philosophically opposed to using water from a distant source to irrigate dryland landscapes. I’m also philosophically opposed to using fire to manage the landscape, since it burns away leaf litter and, if the fire is hot enough, will vaporise nutrients from the plants that are burned, leaving only bare ground to the mercies of wind and water erosion. So all this riotous growth is not just surprising, but downright embarrassing. In part, it may be the result of fire killing the soil biota responsible for cycling and storing nutrients in the surface layers. The soil critters give up their nutrients along with their lives, creating a nutrient “flush” not unlike the application of fertiliser. Ironically, fertiliser has the same fatal impact on soil biota—an effect that no doubt increases the initial impression of its efficacy. However, once the biota are gone, the farmer is hooked on fertiliser as the only way to continue to get available nutrients into the soil. The burn area looking back toward the highway, where the fire started. The slope the sheep are grazing was part of the burn. This photo was taken 7 weeks after the fire. Reading back through what I’ve written, the common thread seems to be the resilience of ecosystems above and below ground to massive change. Resilience arises from diversity—ecosystems more or less by definition are mega-diverse, allowing different elements to thrive in different conditions. Our best defence against greenhouse warming is to maintain the integrity of healthy native ecosystems—they’ve adapted through millenia of short and long-term variability, and have the innate ability to continue to do so if we don’t mess with them. The White Queen was right: the world will be a better place if more of us practice believing impossible things. Preferably before breakfast. 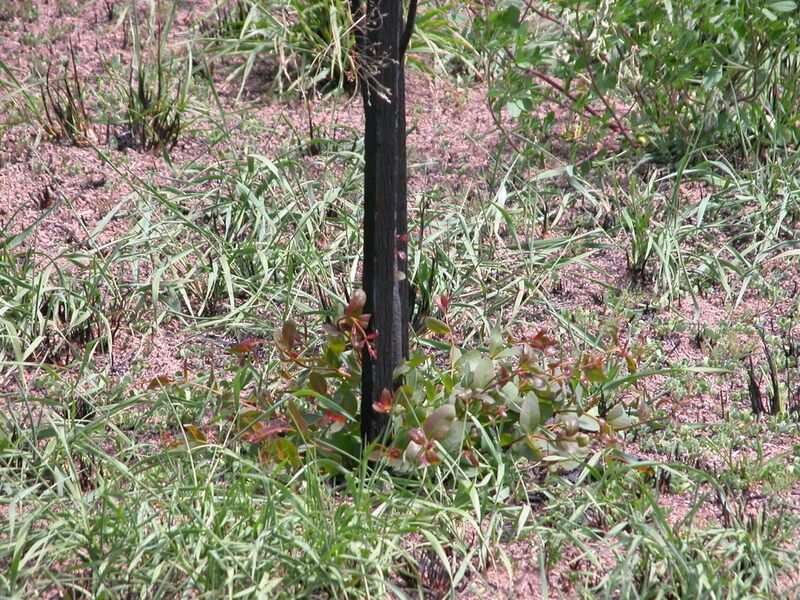 One of the 2-year old scorched eucalypts coppicing–regrowing from the basal node of the tree. Australian natives, at least the eucalypts, are pretty hard to kill, though these looked thoroughly dead after the fire. pring wildflowers–endangered cut-leaf daisies–finally appearing after the autumn rains. A lovely example of ecosystem resilience. These plants have adapted to Australia’s wildly variable seasonal weather patterns, and take advantage of any set of conditions that will let them reproduce.